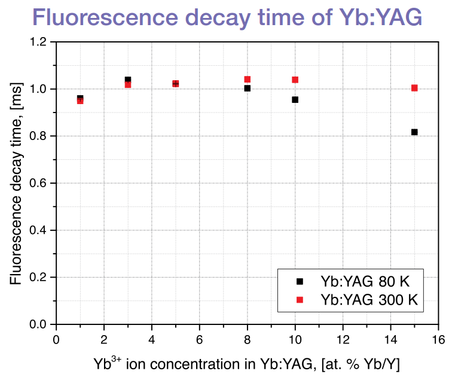 The Yb3+ ion exhibits a small quantum defect and a quasi-three level system with a long upper laser level lifetime, which is important for energy accumulation in Q-switched lasers. 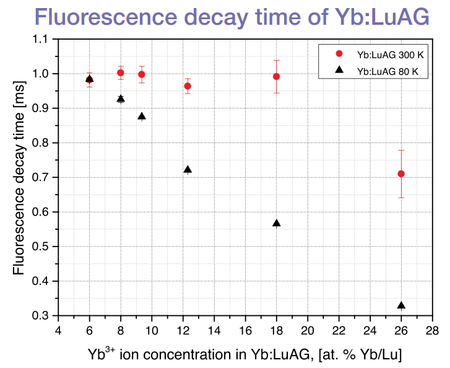 The wide luminescence band of Yb3+ is advantageous for the generation of sub-picosecond pulses. 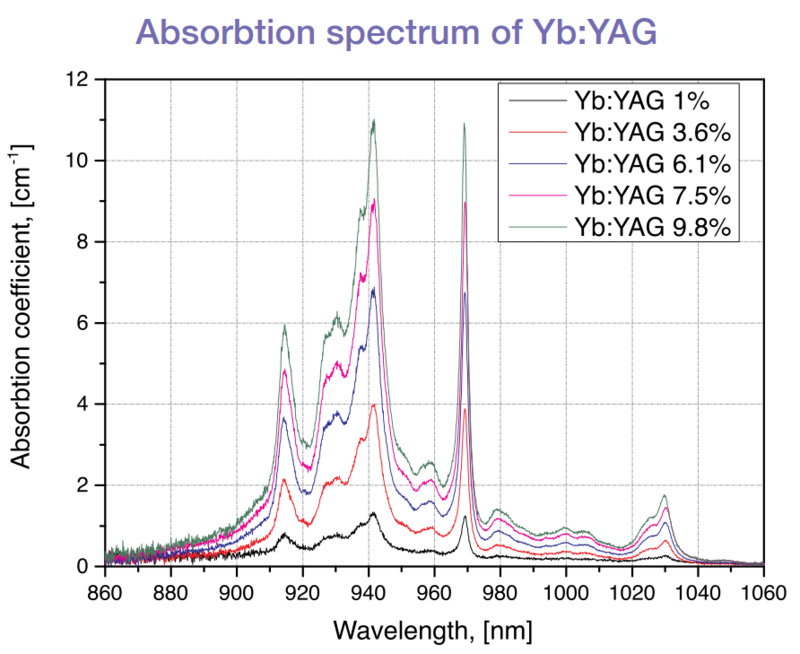 Long energy storage lifetime, broad absorption band at 940 nm and very low quantum defect make Yb:YAG crystal superior candidate for diode-pumped high-energy lasers. Polishing Barrel surface fine ground or polished. Perpendicular or wedged ends. Polishing according to DIN and MIL standards. 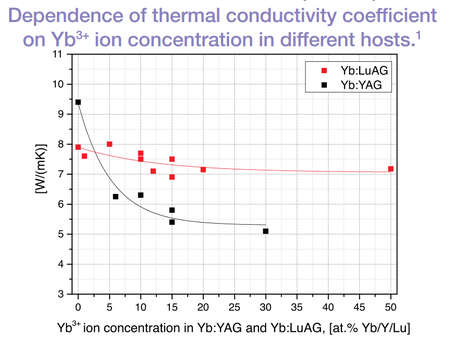 The Yb:YAG/Cr:YAG microchip laser threshold pumping power was found to be 3.3 W. With the increasing pumping power the mean output power, and generated pulse repetition rate also increased up to 1 W and 13.6 kHz, respectively, for the pumping power 9.3 W. The maxim output power was reached without observable thermal roll-over. The laser slope efficiency in respect to incident pumping power was ≈ 17 %. 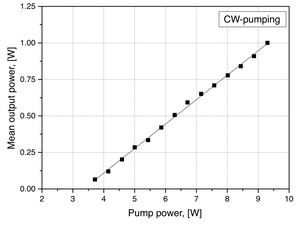 The average pulse width was 1.58 ± 0.04 ns. The maximum pulse energy and peak power value were 73.8 ± 0.7 µJ, and 46.0 ± 0.8kW, respectively. Yb:LuAG is very promising Yb-doped laser material. 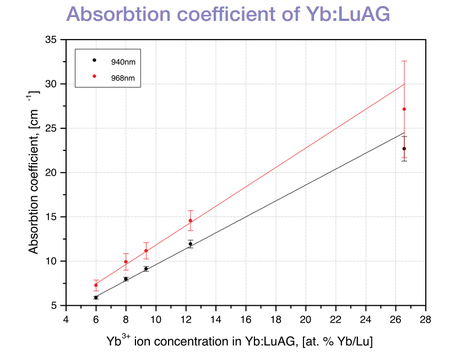 The optical and mechanical properties of LuAG are very similar to YAG crystal. 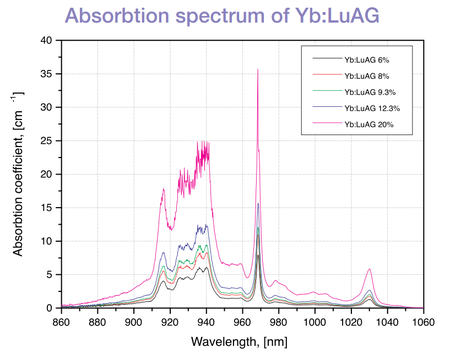 Thanks to similar atomic weight and ionic size of doping Yb3+ ions and substituted Lu3+ lattice ions, the doping concentration has a low influence on lattice vibration modes of LuAG which allow to obtain highly doped Yb:LuAG laser crystal without significant influence on thermal conductivity of this material. Doping concentration 1% - 10% at. 1 K. Beil, S. T. Fredrich-Thornton, R. Peters, K. Petermann, and G. Huber, “Yb-doped thin-disk laser materials: A comparison between Yb:LuAG and Yb:YAG,” in Advanced Solid-State Photonics 2009 Technical Digest on CD-ROM, WB28, OSA, 2009.